You don't need to choose just one. It's a great time to be a music lover with a digital collection, but it may not seem so great if you haven't committed to a single device. If you have a few iOS devices, an Android device (no matter who made the Android device: Samsung, Google, Huawei, Xiaomi, etc. ), and a Kindle Fire, which uses a version of Android restricted to Amazon and does not work with Google Play Music, you may have problems finding a music service that works with all of them. You might also download bargains on music or promotional giveaways and find yourself with a pastiche of music sources and cloud storage options. That's OK. You can get them to work together. The best solution is to duplicate your entire collection in iCloud, the Amazon Cloud, and Google Play Music. All three places offer some free storage for purchased music or other files, and if one source fills up or decides to start charging for storage, you can rely on the other two. iCloud works with Mac desktop and laptop computers, Windows PCs, iPhones, iPads and iPod touch devices. You need to sign up for a free Apple ID if you don't already have one. Your free iCloud account includes 5GB of cloud storage. If 5GB isn't enough, you can purchase more for a small fee. On mobile devices, you turn on the iCloud Music Library in the Settings > Music section. On PCs, from the menu bar of iTunes, choose Edit, then Preferences, and select iCloud Music Library to turn it on. On a Mac, choose iTunes on the menu bar and select Preferences, followed by iCloud Music Library. After your music uploads, you can access the songs in your library using iCloud on your Mac, PC or iOS device. Any change to you make to the iCloud Music Library on one device syncs to all your devices. Apple and other companies stopped selling music with DRM restrictions years ago, but you may still have some early DRM-restricted purchases in your collection. You can't move songs with DRM to other cloud players, but there are ways around that problem. If you're using Mac OSX or an iPhone or another iOS device, you can still take advantage of iCloud to transfer all your non-DRM music. If your music is in iTunes, you can upload up to 50,000 songs from your computer to Google Play for free. Go to Google Play Music on the web. Sign up for a free Google account if you don't already have one. Download the Google Music Manager desktop app to run on your Windows or Mac desktop. Open Music Manager from your Applications folder on a Mac or from the Start menu on a Windows computer. Select the location of your music location. Follow the on-screen instructions to upload your music library to Google Play Music. The Google Music Manager can be set to upload all your non-DRM iTunes music. It may take a few hours to upload your collection, but once you've done it, you can set it to upload all future non-DRM MP3 and AAC files that end up in your iTunes library. That's important for future purchases. It means any songs you buy from Apple or download from Amazon or any other source are going to end up in your Google Play Music library without you having to think about it. You can use that same Google Music Manager on your desktop to download music from Google Play Music for offline play. The Google Play Music app is available for Android and iOS mobile devices to simplify working with your online library from your mobile devices. Amazon does the same thing with its Amazon Music website. Go to Amazon Music on the web. Sign in with your Amazon account or sign up for a new account if you don't have one. Click Upload your music in the left panel. Install the Amazon Music app on the screen that opens. Use the uploader to upload your non-DRM iTunes files to Amazon Music. Just point it to your iTunes library. 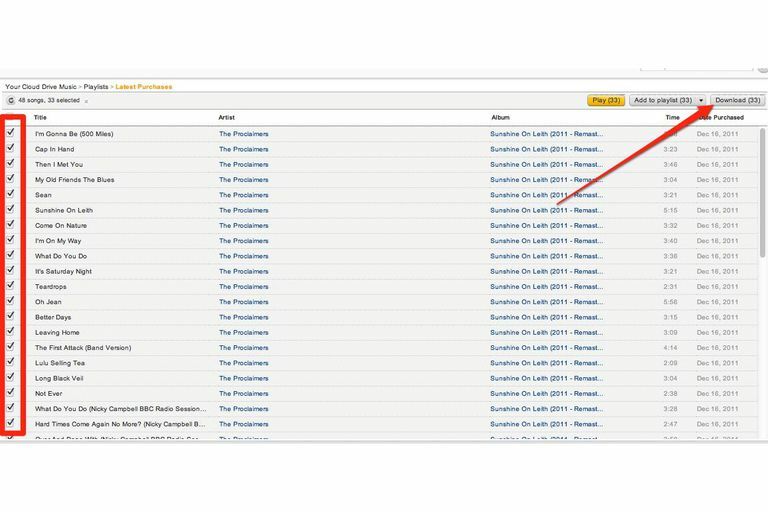 Amazon currently limits uploads to 250 songs unless you subscribe to its premium music service. At that point, you can upload up to 250,000 songs. The Amazon Music app is available for Android and iOS mobile devices to simplify working with your online library from your mobile devices.